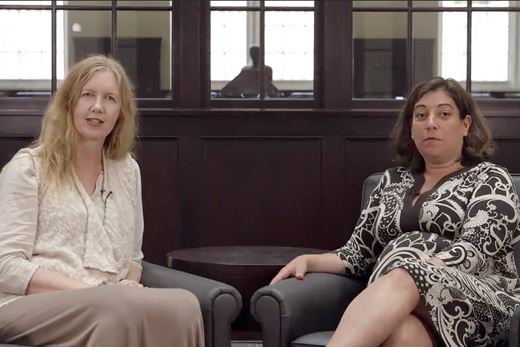 Emory professors Pamela Scully and Deb Houry explore interdisciplinary perspectives on ‘Understanding Violence’ in their new Coursera class. In their upcoming free, open-access Coursera course, “Understanding Violence,” Emory professors Deb Houry and Pamela Scully offer a multidisciplinary glimpse into the complex problem of violence. Coursera is Emory’s partner for MOOCs (massive open online courses). The class runs Sept. 3 through Oct. 22. Scully, a historian and professor of Women’s, Gender and Sexuality Studies and of African Studies, broadens that scope further to integrate perspectives from the humanities and sciences, as well as various interdisciplinary perspectives. This is the pair’s second collaboration around the topic of violence. They co-taught a similar university-wide class last year through the Center for Faculty Development and Excellence. Their Coursera class covers the epidemiology of violence, its biological, psychological and social causes; specific types of violence; media portrayal of violence; the economic impact of violence; its physical and mental consequences; and ways to control and prevent violence in our communities, including criminal justice and public health approaches. Houry and Scully are enthusiastic about the opportunity to reach a larger audience and to engage others in working towards solutions to violence through the open access format. Their audience appears eager as well. Weeks before the start of the course, there are already over 15,100 students enrolled.